After defeating the New Orleans Saints and a controversial missed pass interference call late in the fourth quarter, the Los Angeles Rams will play the New England Patriots in Super Bowl LIII. This will be the first Rams appearance in the Super Bowl since 2002, when they also played the Patriots. While the New England Patriots have been on a hot streak since entering the playoffs, the game will ultimately go to the Rams. 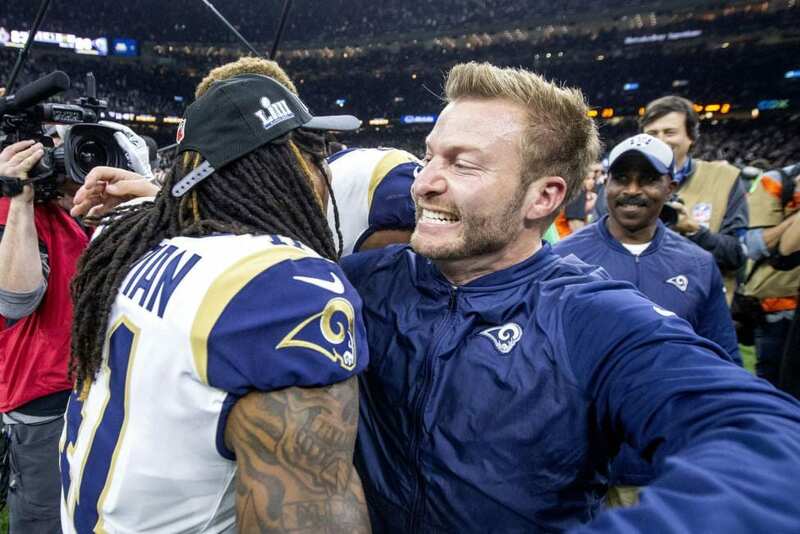 Two key aspects that will help lead the Rams to victory are their consistent offense and defense—aspects that 33-year-old head coach Sean McVay knows how to control within any game. On the offensive side, third-year quarterback Jared Goff is looking to make a name for himself after being drafted first overall in the 2016 NFL Draft. This season Goff has career-high stats throughout all categories, with 32 touchdowns, a 64.9 percnt completion rate, and a total of 4,688 passing yards, putting him fourth for highest passing yards during the regular season behind Ben Roethlisberger, Patrick Mahomes, and Matt Ryan. Rams running back Todd Gurley has also been having a good season with 1,251 yards, putting him third in rushing yards. He proves to be the difference-maker when he is healthy and on the field for the Rams. For example, in a game against the Denver Broncos, Gurley completed the game with 208 yards, two touchdowns, and 28 carries which resulted in a win. Against the Chicago Bears, he only completed 11 carries and 28 yards with no touchdowns, which resulted in a loss for the Rams. On the defensive side, starters such as Michael Brockers, Aaron Donald, Ndamukong Suh, and Marcus Peters must put on the games of their career in order to stop Tom Brady and his offensive weapons. Aaron Donald has proven to be a defensive nightmare against any quarterback that steps in his way. He led the league at 20.5 sacks this season and is still hungry for anyone that comes in front of him. Overall, the game will be tough, being against the veteran team that is the New England Patriots. Hopefully, the Rams will bring the consistent game play they have used throughout the season. They will be the dominant team in the NFC and will be holding the Lombardi Trophy in Atlanta at the end of the night.